With the success of the Nationalist Ebro offensive in 1938 the Republican armies succeeded in reuniting their Catalonian forces with the main areas under their control. Given that the eyes of the world were now increasingly focused towards central Europe, and that both sides in Spain had seen their respective supporters gradually draw back their involvement in the peninsular the war slowly turned into a trench bound stalemate and by 1940 had drifted into an unofficial truce with both sides ruling their respective parts of Spain as they saw fit. After the fall of France many expected Hitler to continue south and complete the job that Franco and the Nationalists had started. However his eyes were firmly fixed eastwards and the Republican regime survived. Both sides in the civil war provided “volunteers” for their respective allies on the Eastern front, the Nationalists the Blue Division, whilst the Republican’s provided the aptly named Red Division. With the end of the war both of these volunteer forces returned home, indeed the majority of the Blue Division had done so in 1944. Amongst these returnees were the airman of the Red Division who also brought with them their mounts as a gift from the grateful Russian nation. The details of the Coup d’état of 1948 which saw the leftish Republican government replaced by a much more Stalinist aligned one are beyond the scope of this brief history but none the less it caused serious ripples among western governments who now found themselves having to support a Nationalist government who was a supporter of the “other side” during the war. 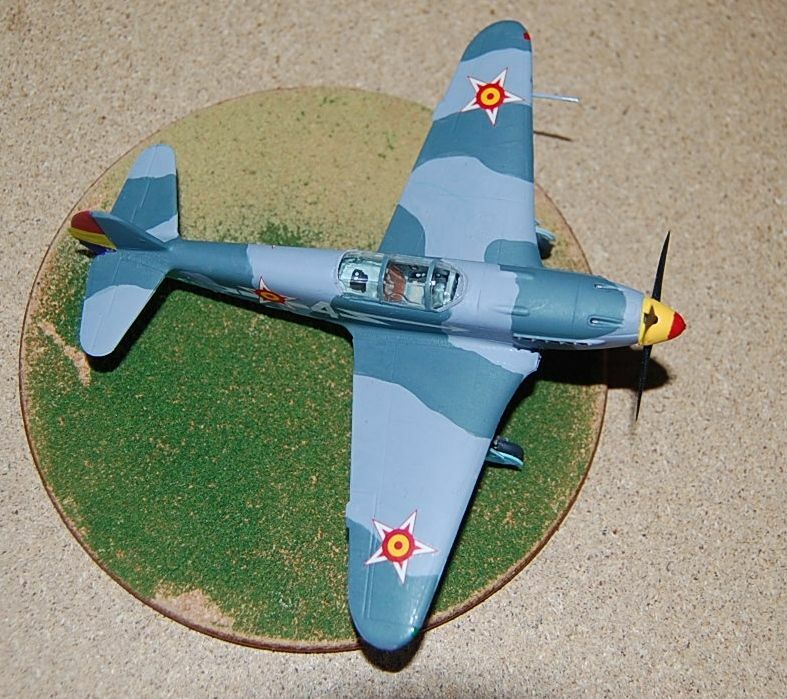 Thus while Franco’s forces received P 51’s and A 26’s the Republicans received Yak 3’s and 9’s and Tu 2’s. 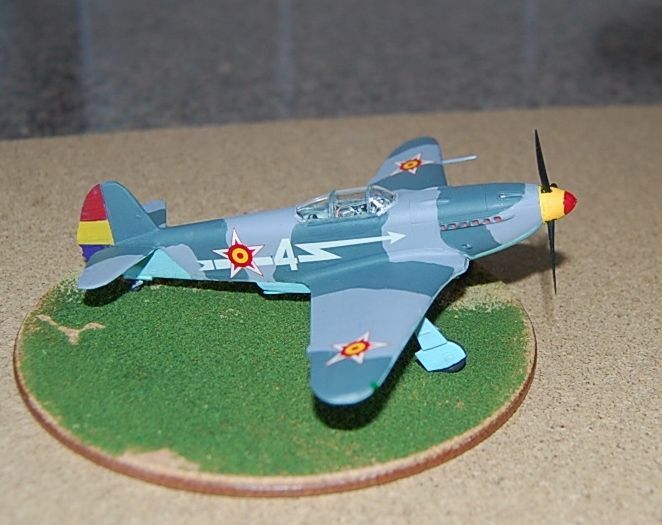 This then is a Republican AF Yak 3 of the famous Red Division based in Barcelona during 1949/1950. It wears the then new national markings of a red star superimposed by a roundel in the Spanish national colours, red/yellow/red together with the rudder striping worn by Republican aircraft in the civil war. 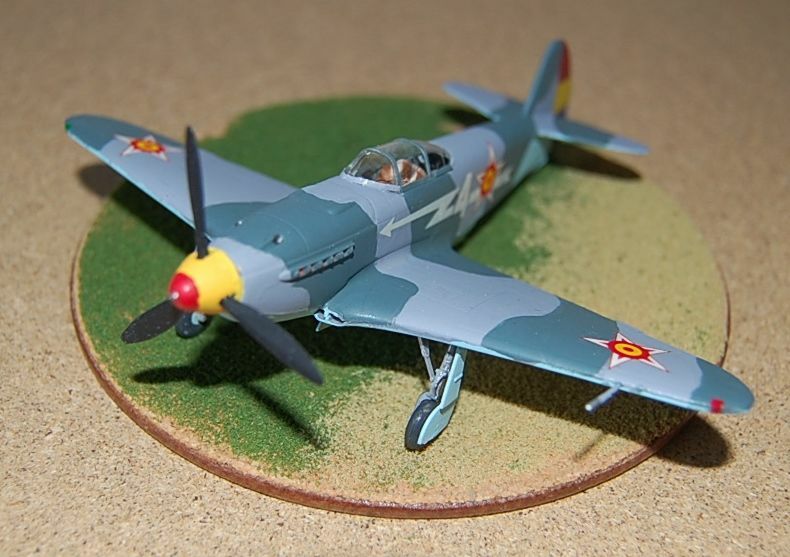 Kit is the Hasegawa one and is a fairly simple kit that goes together well. Paints are White Ensign enamels for the Russian shades with my normal mixture for the others. 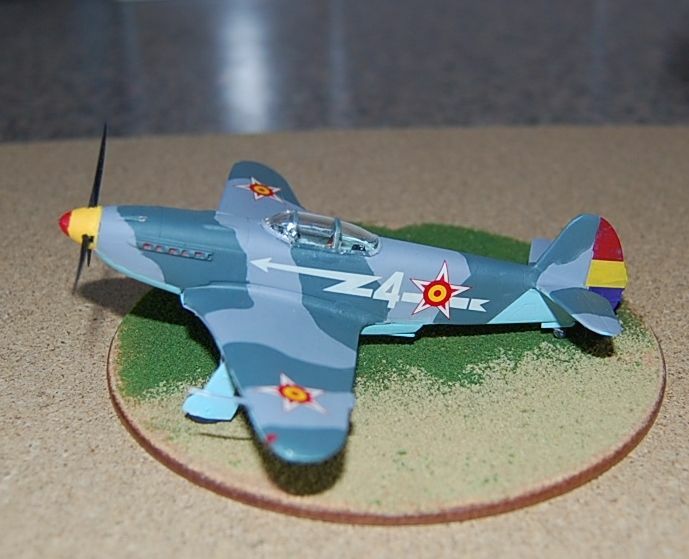 Markings are from the kit with the rudder hand painted and I used Spanish national markings from an old F5 kit to create the superimposed red star. Cool - simple, but effective! Had a similar Red Star idea for a "Finnish Republic of the Soviet Union" - looks great! Nice one Chris ! Pretty flashy ! Don't know how I overlooked this one until now, Brother Narses but yep, that's a good 'un!